The new Chemistry Center will host a Science Commons Kick Off geared for students on Friday, Sept. 25, beginning at 3:30 pm in Atwood 260. Six professors will give "flash talks" on their collaborations involving chemistry. At 4 p.m., students will gather throughout the atrium to raise a toast in collectible cups. "We want the students to pause a moment to celebrate the new building and all that it represents," says Kira Walsh, outreach coordinator for the department. The toast will be followed by more flash talks and then a barbecue dinner in the courtyard. The official grand opening begins at noon on Saturday, Sept. 26, with a dedication ceremony, including remarks by President James Wagner and Dean Robin Forman. A ribbon immolation will be followed by other fun science demonstrations in the courtyard, and tours of the building will continue throughout the afternoon. Expect sparks when the Sanford S. Atwood Chemistry Center addition officially opens on Saturday, Sept. 26, during Homecoming Weekend, with a smoking-hot ribbon immolation. In the spirit of the innovative space, designed to foster a new era in science research and education, the ceremonial ribbon will not be merely cut with scissors: It will be severed by 3,000 degrees of molten iron in a fiery thermite reaction. Starting at noon, President James Wagner and Emory College Dean Robin Forman will give brief talks in the courtyard about the importance of the Chemistry Center — the hub of Emory's growing Science Commons — to the university, the region and the world. David Lynn, who has served as chair of chemistry since 2006, will also give brief remarks before passing the baton to incoming chemistry chair, Stefan Lutz. "Science is happening at the interface between disciplines – and not just science disciplines," Lynn says. "We are a liberal arts institution and we want to forge connections throughout the campus community. We've created the space to catalyze these interactions." Many of the biggest challenges that the world now faces – from renewable energy to a changing climate and diagnostics and treatments for diseases – require creative approaches from a range of vantage points, Lynn says. "We want students coming in to bring all their different experiences and perspectives to bear to help solve problems," he says. "We are leading the way, and setting the standards, for new and better ways to educate science students for the future." Following the dedication ceremony and ribbon immolation, the new park-like courtyard that connects Atwood to Cherry L. Emerson Hall will come alive with other fun science demonstrations, including the creation of an artificial cloud by Pi Alpha Chemical Society, a social and service group of Emory graduate students. Tours of the new facility will take place throughout the afternoon. The new Chemistry Center recently received LEED Gold Certification. It achieved this high standard set by the U.S. Green Building Council's Leadership in Energy and Environmental Design program by recycling knocked-down materials during the renovation, designing a ventilation system that recycles air into lab spaces, tapping natural light streaming through its glass outer walls, and reclaiming rainwater from a cistern. While Saturday marks the grand opening, the new Chemistry Center was embraced by students and faculty in mid-August, as soon as the dust had cleared and the barricades came down to reveal the dazzling results of the two-year, $52 million expansion and renovation project. "The best part about this new building is all of the people in it," says Todd Polley, director of operations for the chemistry department. "Just walking through the atrium you run into people from all across the university. The connections we hoped the Science Commons would spark are already happening." The imposing concrete wall of Atwood that formerly faced onto Dickey Drive is now transformed into a much more inviting glass façade. Visitors are drawn in by the enticing aromas of the Highland Bakery "Coffee Lab" near the entranceway. The ground floor of the atrium houses a wall-less library and interactive learning space, the heart of the Science Commons, dotted with breakout nooks that have chairs and white boards to encourage discussion and collaboration. From the atrium, one can look out onto the green space adjoining the building and up into five floors of glass-walled research labs, classrooms and workspaces. "We want people to see the research and teaching as it's happening," Lynn says, explaining why visibility and openness are built into the design. "This is a place made to exchange, nurture and grow ideas. We want everyone to feel empowered by the energy of the space." On a recent afternoon, Emory senior Taimour Sheikh, a political science major, sits beneath a skylight on the third floor of the atrium. He faces out onto the bright, open space below as he revises a paper he wrote. "I love studying here because of the natural light and the spaciousness," Sheikh says. "It makes me feel relaxed." Below, on the ground floor of the atrium, Maddie Dew, a junior majoring in anthropology and math and computer science, sits at a table tapping on her laptop. "This has already become a popular place to study on campus, and not just for chemistry majors," she says. "I'll often see students gathering at the white boards to work out problems together. You really get the feeling that this space is building community." Fluidity is a major design feature of the complex, from the sweeping staircase in the center of the atrium and curving, glass-walled walkways to the swirling, abstract paintings by Emory alumnus Brendan O'Connell. "These fluid elements reflect the dynamic nature of molecular systems and their ability to evolve," Lynn says, "and, on top of that, the ability of our campus community to keep evolving from individual labs and departments and disciplines into ones that are more closely connected with one another." O'Connell, now an internationally known artist, will return to campus for the Chemistry Center dedication and Homecoming Weekend. His oversized paintings add powerful bursts of color and energy in the sunny atrium. "There is a strong element of art in chemistry," says Nathan Jui, an assistant professor in the department. "The paths we take to solve problems are governed by physical rules, but the ways we apply those rules are often creative and elegant." Jui's organic synthesis lab collaborates with the Winship Cancer Institute to research potential treatments. "Today, computers give us access to tremendous databases that allow us to quickly comb through mountains of information," he says. "That allows us to think of lots of different problems in new ways, and to move beyond traditional teaching methods." The lecture hall that once fronted Atwood is now an interactive teaching space. Students sit at round tables, surrounded by large video screens connected to computers. Each table of students tackles problems as a group, mentoring and teaching one another. The solutions from each group can be projected onto the surrounding screens, so that the class as a whole can evaluate the different approaches and learn from them. "First-year students will immediately become part of the chemistry community, participating and engaging," Lynn says. "Classrooms and laboratories are much more integrated as well." 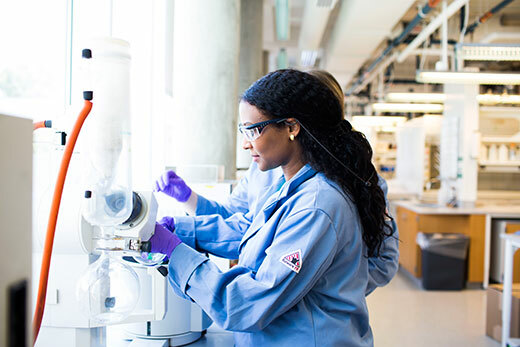 As part of this initiative, Emory is re-envisioning its undergraduate chemistry curriculum, supported by a $1.2 million grant from the Howard Hughes Medical Institute. Like the new building, the new curriculum, set to debut in the fall of 2016, will focus on openness and direct engagement with research. "Having students do hands-on research gives them a window into how chemistry applies to their everyday life," says Eilaf Egap, an assistant professor who joined Emory this fall. Egap's lab, which includes collaborations at the Emory School of Medicine and Georgia Tech, researches new approaches to making polymer semiconductors with interesting electronic and photonic properties. The goal is to develop light-emitting diodes, sensors and transistors with applications for everything from solar cells to biological imaging and therapeutics. "I love the energy and creativity that students bring to the lab," Egap says. "They are curious, excited and eager to make a difference in the world."